The group got their start in 1967. They recorded their first two singles "Ayer Nomás" and A-side "La Balsa", which turned into an unpredicted large scale hit in the Argentine winter of 67, selling over 200,000 copies, leading to their full-length debut later that year. The following year they went on tour around the Southern Cone, and then released their 2nd album Seremos Amigos, permeating psychedelic rock during the height of that sub-genre of rock. The band's third effort after a short break-up, 1969's Beat N°1, featured the addition to the group of Pappo. His rocking blues style with Litto Nebbia's more classical melodic approach at times made the album uneven, but also created quite dazzling passages of music that can be considered one of the earliest recordings of progressive rock anywhere in the world, previewing the rise of the genre around the world in the 1970s. 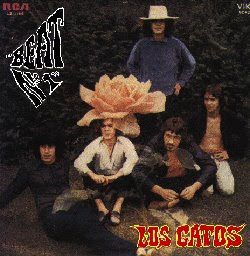 In 1970, Los Gatos released their fourth major album. Originally called Rock de la mujer podrida (literally "Rotten woman's rock"), the band was forced to change the name of the release by government censorship to Rock de la mujer perdida ("Lost woman's rock"). A harder rocking album with Pappo's fingerprints all over, it would be Los Gatos's last. Later that year Pappo left the band to form his own heavy blues-rock group Pappo's Blues. Los Gatos disbanded after a last batch of concerts, with Litto Nebbia kicking off his solo career.